The Purobio Contouring Sculpting Brush makes it possible to carry out the sculpting techniques for a refined face! Made of ultra-soft synthetic hair, it does not irritate the skin and is suitable for very sensitive skin. Its flat and specific shape allows sculpting with precision the lines of the face with your bronzing powder. With the Purobio Contouring Flat Brush, you will be the master of contouring's arts! 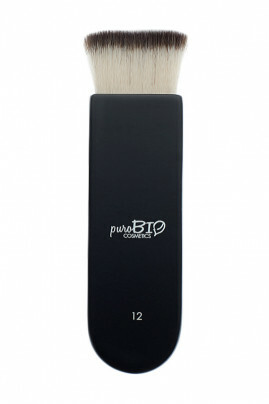 PUROBIO Contouring Flat Brush draws a perfect line to refine your face! Apply your bronzer by using the Purobio Contouring Brush to draw a line to accentuate the hollow of the cheek. Blend for a natural effect. For more precision, renew until the desired effect. For a better rendering of the cheekbone line, it is advisable to grasp the brush barely above the hairs so as to tighten them slightly and thus have a better grip to create a narrower line to blur.